Many crops (and plenty of non-crop plants) rely on pollinators. Let’s protect them! As I’ve discussed before, the natural enemies that provide biological control of pests include both larger creatures (like insects, mites, and nematodes) and microorganisms (fungi, bacteria, and viruses) that combat pests in a variety of ways. Microorganism natural enemies are regulated as pesticides (one type of biopesticide), while the larger natural enemies are not. 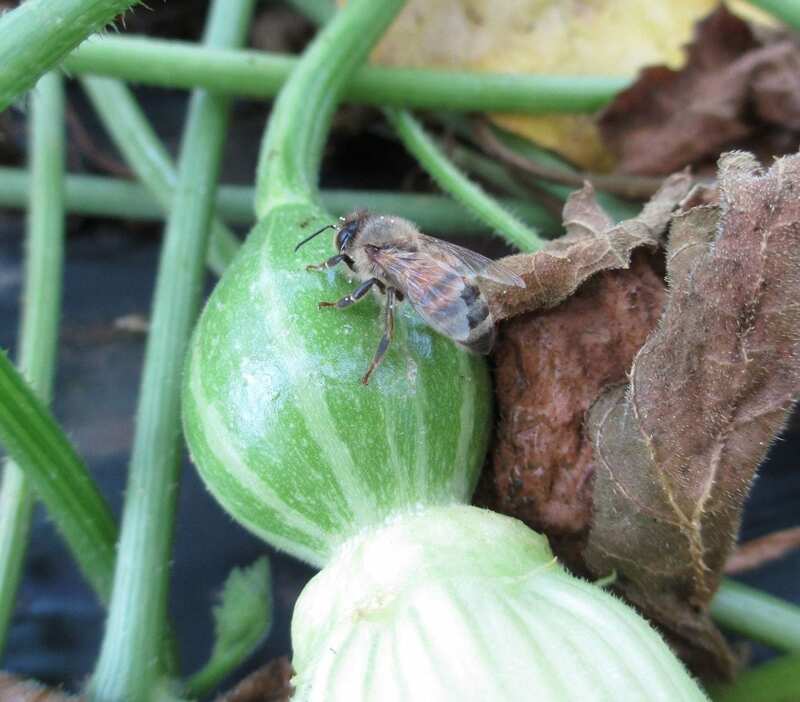 Growers who are successfully using biocontrol insects, mites, and nematodes usually recognize that they need to apply pesticides in such a way that they are compatible with the biocontrol organisms they use. Take a look at my April post for a summary of online resources that can help you check compatibility of pesticides (including biopesticides) with natural enemies. Some of these compatibility resources include information on the effects of pesticides (and biopesticides) on bees. Pollinators (including honey bees, lots of other bees, and some non-bees) are very important beneficial insects. You may have noticed that they have found their way into several of my blog posts. So, I wanted to let you know about a brand new resource (hot off the digital presses) to help you protect pollinators. 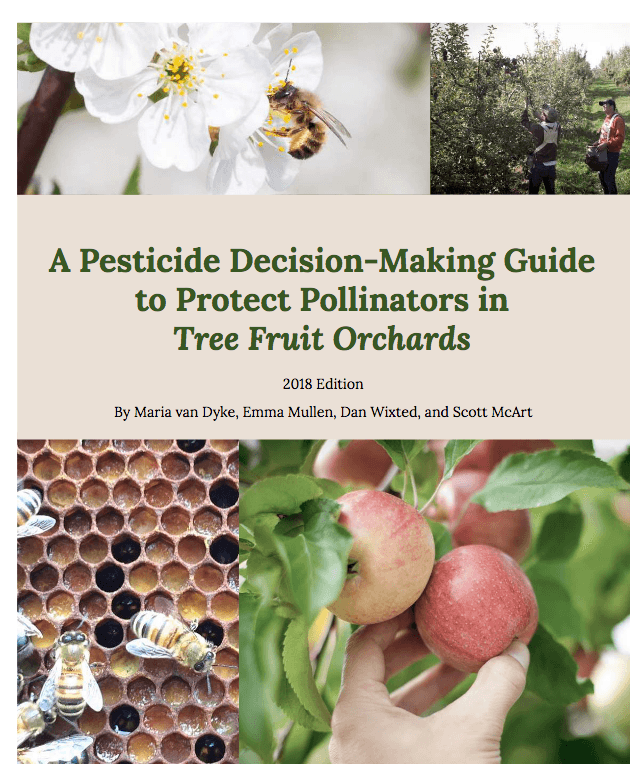 “A Pesticide Decision-Making Guide to Protect Pollinators in Tree Fruit Orchards” is a terrific resource to help you choose pesticides (and pesticide combinations) that are least-toxic to bees. It includes information not only on pesticides used alone, but (when available) on synergistic effects when multiple pesticide active ingredients are used together. When you combine some chemicals (either in the tank or in the environment) the mixture is more toxic than both chemicals alone. Where available, it summarizes pesticide toxicity to other bees besides just honey bees (e.g., bumble bees and solitary bees). You can read more about why this is important in this recent article. It describes what we know about sub-lethal (in other words, negative effects on the bees that are less serious than death) effects of pesticides on bees. It includes about half a dozen biopesticide active ingredients. Pollination is being done by more than just honey bees! This bumble bee (plus many more bee species) are important pollinators in NY. You might be asking: If a chemical on this table is toxic to bees, will it also be toxic to the insect and mite natural enemies I am releasing or conserving on my farm or in my garden? I wish I had a definitive answer to that. As you can see from the nearly three pages of Literature Cited at the end of this document, collecting these data is a time-consuming process. For now, stick with the compatibility resources that are already available, and ask the companies you buy from (pesticides or natural enemies) about compatibility. In closing, a huge amount of work went into this resource to summarize so much useful and current (as of October 2018) information in an easy-to-read table. Bravo to the authors! 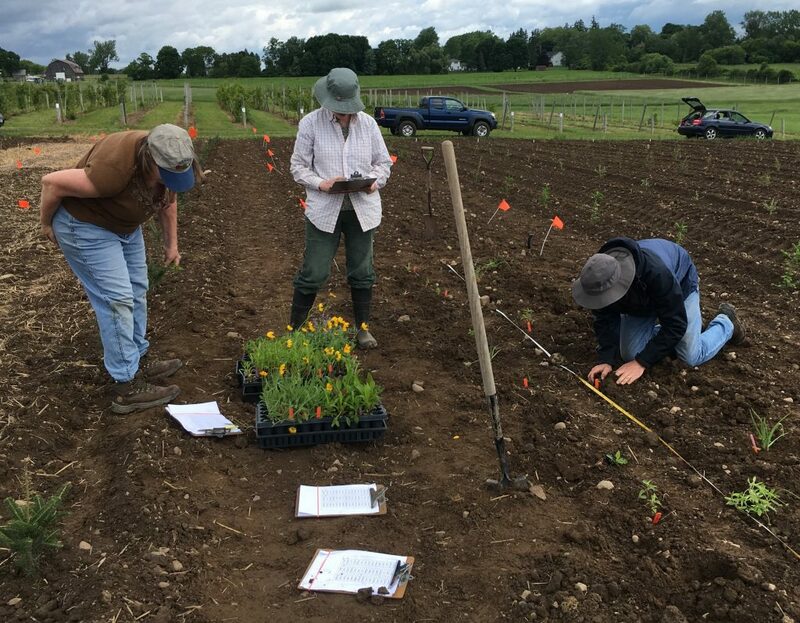 The Pollinator Network @ Cornell has other helpful resources for growers on protecting pollinators. Winter is a great time to make plans for using IPM and protecting the pollinators and natural enemies that are so good for the crops we grow! Some of our beneficial insect habitat plots looked really beautiful this fall! Others are still works in progress. Remember back in June when I told you about the different techniques we were comparing for establishing habitat for beneficial insects? Time for an update! Here’s a brief, two-page summary of the first year of this project. For all the juicy details (and lots of pictures), keep reading! First, remember that when I say “beneficial insects”, I mean both pollinators and natural enemies of pests. (Technically, arthropod would be a better term than insect, because spiders and predatory mites are some of the beneficial creatures we’d like to attract.) Fortunately, the same type of plants provide food and shelter for both pollinators and natural enemies on your farm or in your garden. We used six different techniques to establish this habitat during Spring, Summer, and Fall of 2018. Treatment E was our control, where we did nothing but mow (after initial herbicide applications). We planted seeds in treatments C, F, and G. The seed mixture we used was the Showy Northeast Native Wildflower & Grass Mix from Ernst Seeds, which included a more diverse species mix. This mix changes a bit from year to year. If you’re interested, you can learn about the details of the specific mix we used here. Not surprisingly, there were big differences in how much time and money we spent on different treatments this first year. The costs and hours below are for a total area of 460 ft2 (0.01 A) per treatment. Most of the cost differences are due to the huge difference in seed versus transplant expenses. We paid about $2 per plant and needed 180 plants for each treatment. In contrast, we spent about $12.50 on seed for each treatment. You can find itemized lists of cost and time inputs for each treatment here. But, there were also big differences in how quickly the plants established. By September, both treatments (A and B) that had been transplanted in the spring looked like well-established gardens, with large, blooming wildflowers. 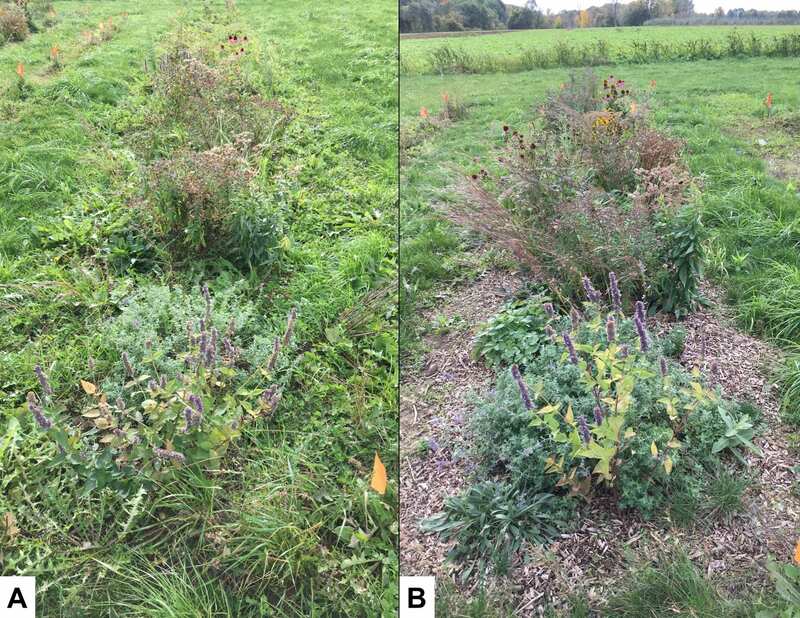 Four and a half months after transplanting, the beneficial habitat plants in treatments A (left) and B (right) were mostly growing well. But there was a big difference in weed control, in spite of similar amounts of time spent weeding each treatment. We were generally pleased by how well most of the spring transplants survived. Although all the transplants came in 50-cell flats, some were larger than others, and the larger transplants survived better. We were fortunate to be able to plant into nice moist ground, so except for a little water on the day of transplanting, we didn’t irrigate. Survival might not have been as good if we’d had different planting conditions. In contrast, the much less expensive treatment C was not looking too impressive even by October. A few partridge peas and blackeyed Susans bloomed this year, but otherwise it didn’t look much different from the control plots. In mid-summer, it looked like we were growing more ragweed than wildflowers. In late July, it looked like we were growing mostly ragweed in treatment C (left). But after mowing four times during the summer and fall, you could definitely see the blackeyed Susans establishing (right). Two of the treatments (F and G) were planted with seeds this fall, and one treatment (D) was transplanted this fall. So it’s really too early to tell how successful those treatments were. Stay tuned for more updates! 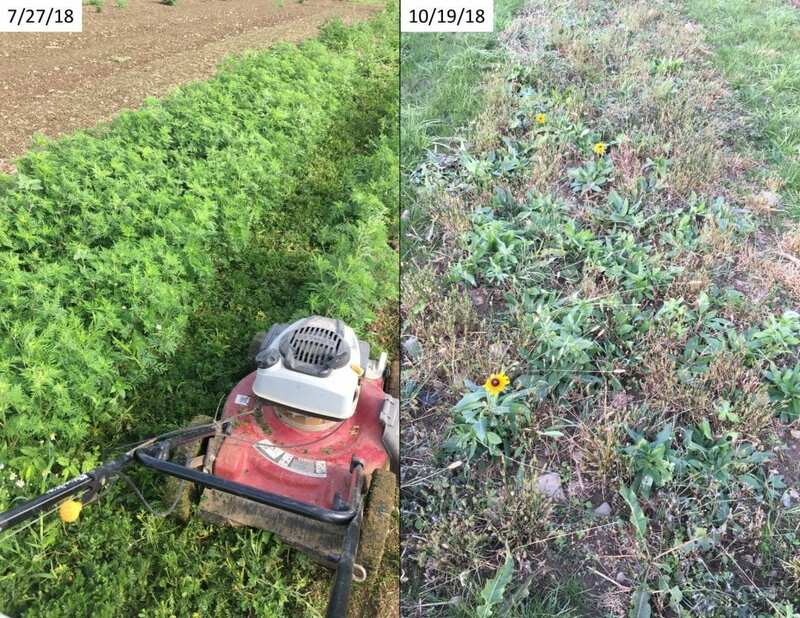 Fall transplanted (D) or direct seeded treatments (F and G) did not look very impressive by October 19, 2018. I’m curious to see what they look like next spring, summer, and fall! What about weeds? The graph below shows the average percent of the surface area of each plot that was covered with weeds versus planted beneficial habitat species on September 19, 2018. (Thank you, Bryan Brown, NYS IPM Integrated Weed Management Specialist for doing a weed assessment for us!) 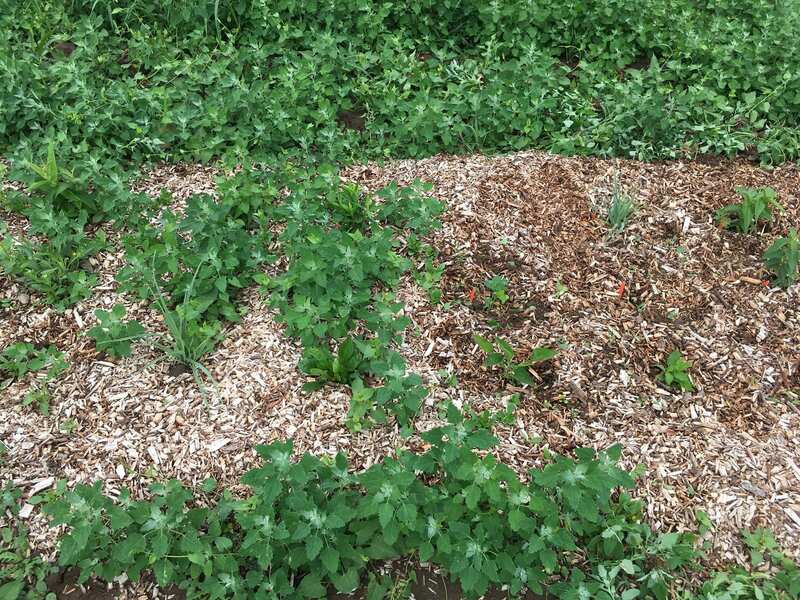 While we spent about the same amount of time weeding treatments A and B (the time difference is due to the time spent mulching treatment B), we achieved much better weed control with the mulch than without it! 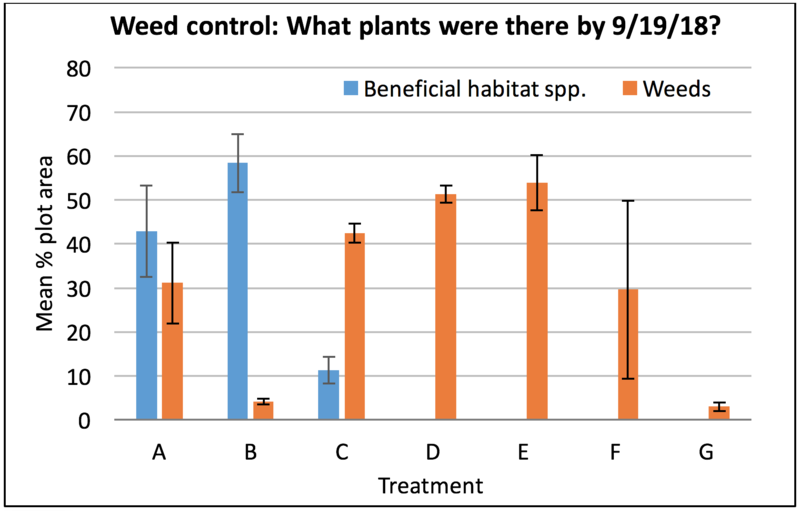 Bryan Brown assessed the percent of each plot that was covered with either the beneficial habitat species we had planted (blue) or weeds (orange). Each bar represents the average of four plots for each treatment, and the error bars show the standard error. In treatment B, we spread chipped shrub willow mulch about 3 inches deep around the transplants. If I were to do this again, I would spread it thicker. I was disappointed with how many weeds were growing through the mulch just a month after transplanting. The chipped shrub willow mulch we used was not as effective at suppressing weeds as I had hoped. On the left is part of the plot that had not been weeded yet. On the right is the part that was weeded on July 6. 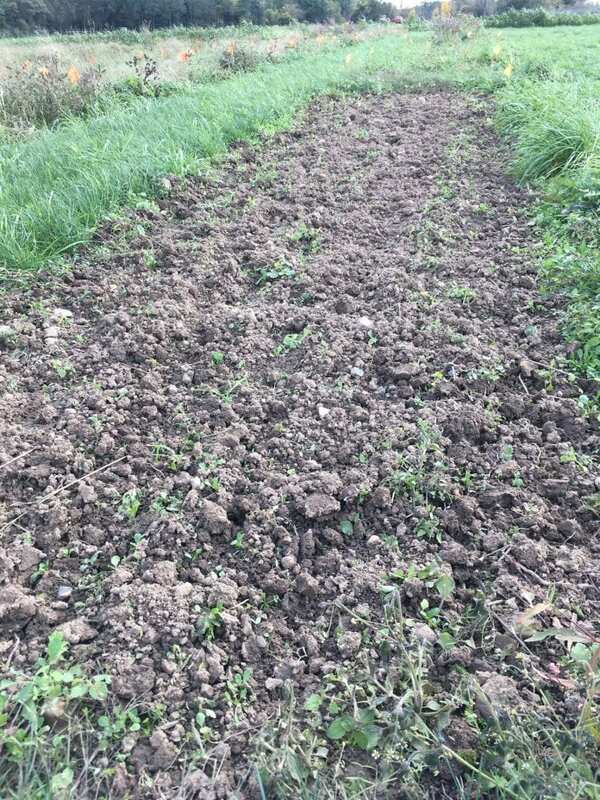 You can also see from this picture that there was a lot of lambsquarters in this field, and that we hadn’t been able to seed grass between the plots, yet. But weeding twice during the season pretty much took care of the weeds in treatment B. Treatment A was also weeded twice, but as you saw in the graph earlier, weed control by the end of the season was not as effective. Treatment A (transplanted in the spring, with no additional weed control) before (right) and after (left) hand weeding on July 6. 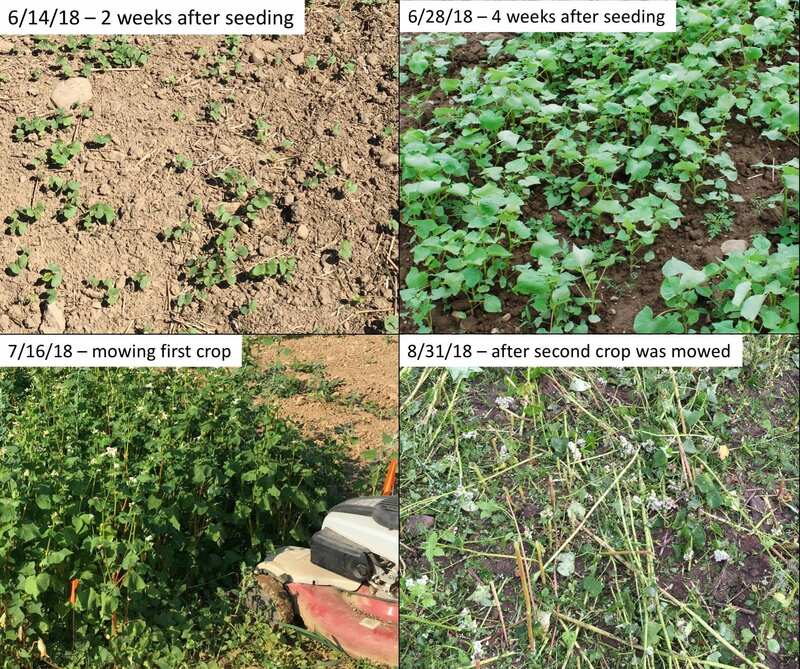 I think we’ll have to wait until next year to really understand how weed control is working in treatment C. Remember, the strategy was to slowly deplete the annual weed seedbank by allowing weeds to germinate, but preventing them from producing more seed. This is not supposed to be a quick establishment method, and it wasn’t. This is what partridge pea looks like. 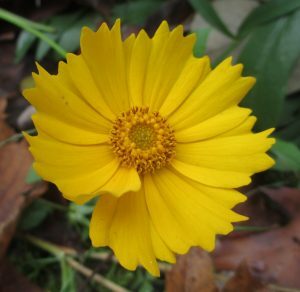 It was one of the few species from the native wildflower and grass mix seeded in the spring (treatment C) that bloomed during this first growing season. By the time Bryan did our weed assessment, it had been 3 weeks since we mowed the second planting of buckwheat. Ideally, we would have transplanted shortly after mowing the buckwheat. 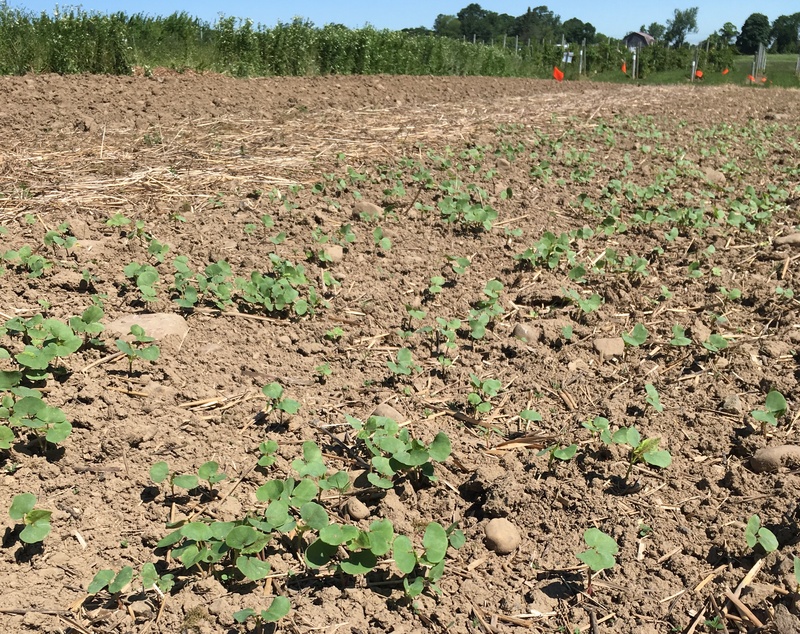 But, the second crop of buckwheat was starting to set seed by the end of August, and our transplants weren’t scheduled to arrive until the end of September. So we mowed the buckwheat early to prevent it from contributing its own seed to the weed seedbank. But this meant that a lot of weeds had time to germinate before we transplanted the habitat plants. The buckwheat certainly suppressed a lot of weeds during the growing season, and I hope that this will help reduce weeds next year. The buckwheat established quickly and crowded out many weeds. We mowed the first crop in July and re-planted. We had to mow the second crop about 3 weeks before we transplanted habitat plants (not ideal). Overall, we were pleased with how the solarization worked. 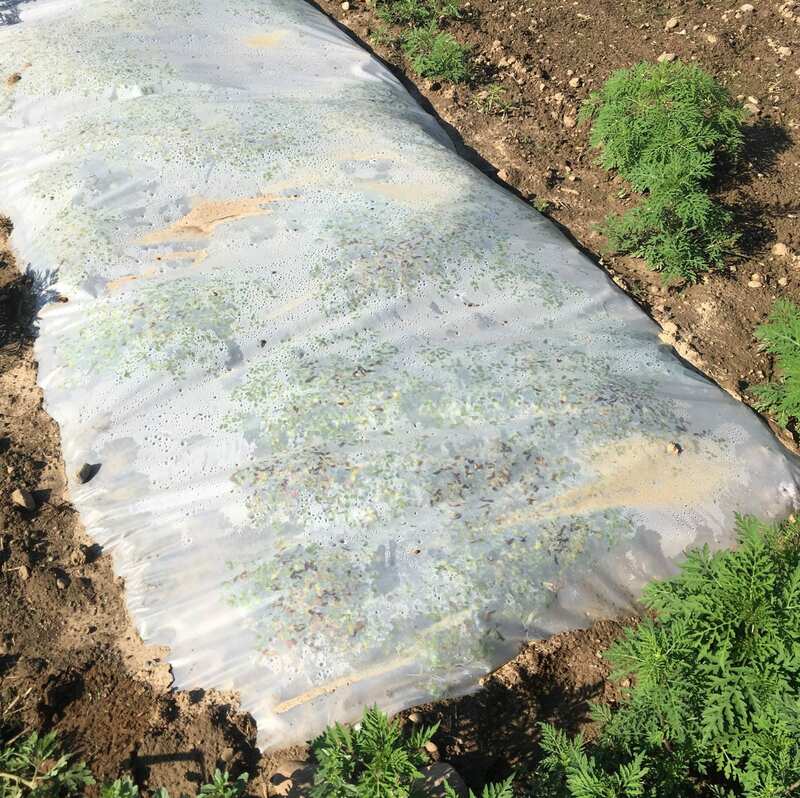 We laid down 6 mil clear plastic (leftover from a nearby high tunnel) in early June, and did a little weed control around the edges of the plastic just once during the summer to prevent more weed seed production and to prevent shading of the plots. 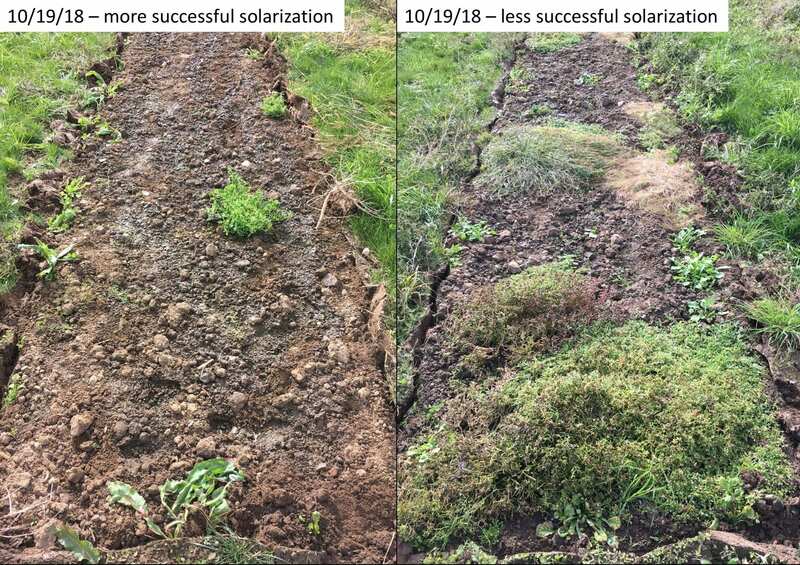 We laid 6 mil clear plastic over some plots on June 5, 2018 to solarize the soil underneath (and kill weeds). We also learned that solarization will not control purselane. In contrast, the purselane thrived only under our clear plastic, and nowhere else in the field. The plot that had the most purselane also had the most other (mostly grass) weeds. I think the purselane pushed the plastic away from the soil and reduced the temperature a bit, allowing other weeds to grow. In some solarized plots, purselane grew happily under the plastic. 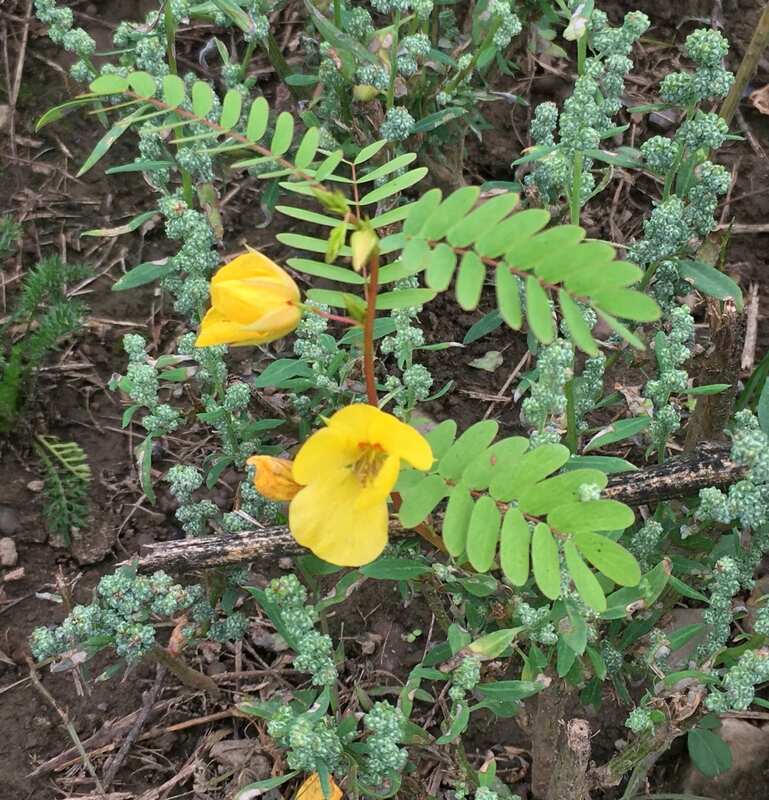 Purselane was not a common weed anywhere else in the field during the season. Some other plots were virtually weed-free when we pulled the plastic up in October. (Did you see how large the error bar was for weeds in treatment F in the weed graph above? This means there was a lot of variability between plots in this treatment.) Our soil temperature probe happened to be in the plot with the most purselane, and we still achieved maximum soil temperatures of 120 °F (at a depth of about 3 inches), compared to 90 °F in a nearby control (treatment E) plot. Solarization results were pretty variable from plot to plot. In some plots, it worked great (left). In other plots more purselane germinated and it didn’t work as well (right). We cut all the weedy vegetation off at the ground before direct seeding the beneficial habitat plants. 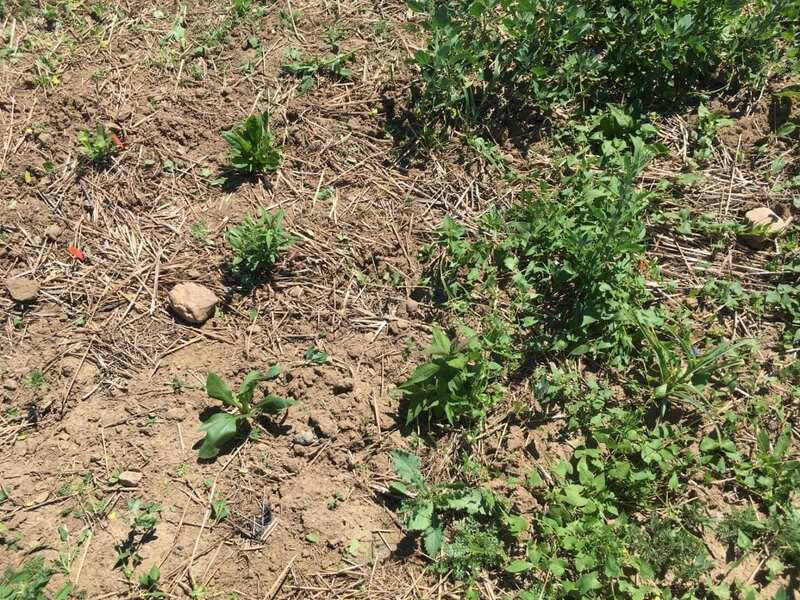 At the weed assessment in September, the plot that had been alternately treated with herbicide and tilled looked best in terms of weed control. Like treatment C and all the treatments planted (by seed or by transplant) in the fall, I think we’ll get a better idea next year of how effective this method was at suppressing weeds. A few weeds were present a week after the last time the herbicide/tillage treatment (G) was rototilled. We broadcast, raked, and pressed beneficial habitat seed into these plots. One thing we struggled with this fall was deciding when to plant the wildflower and grass seed mixture. One source recommended the seeds be planted sometime between October and December. 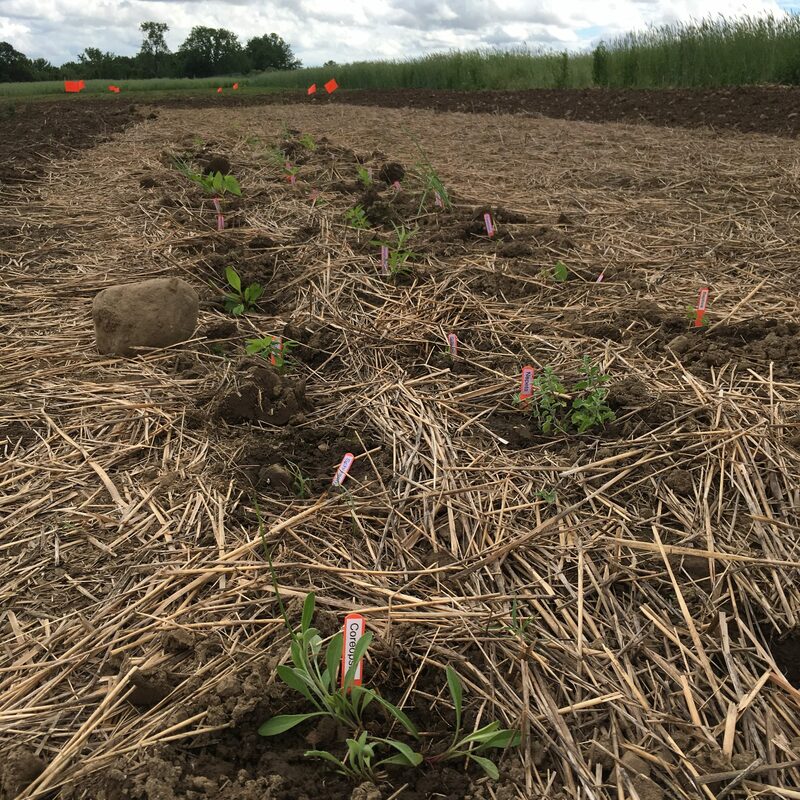 We were cautioned that if we planted the seed too early, some species (especially blackeyed Susans) might germinate this fall, and the young seedlings would be killed by an early frost before they established. But we were also afraid of waiting too long and not being able to till the soil (treatment G, only) if it got too wet. And we wanted a nice smooth seedbed. In treatment F, we suspected that leaving the clear plastic on into November would protect the weeds from the cooler weather. But we worried that taking it off too early would only allow more weed seeds to blow onto the bare ground. We direct seeded October 18, 2018, after the weather cooled down a bit, and before the ground got too wet. Finally, we compromised and planted the seeds on October 18 and 19, after our first hard frost, and once it looked like the nighttime temperatures would be in the 40’s (or below) for the next 10 days. It was only a week after the last tillage in treatment G, and the soil was still relatively dry. Those who live in the Finger Lakes know that late October and early November were pretty wet this year, so I’m glad we planted when we did. If you are trying to time fall seeding, I would recommend that you keep an eye on the 10 day forecast to see when temperatures are starting to cool. But if you get a dry sunny day to plant and it’s reasonably cool, I wouldn’t delay. So if I want to plant habitat for pollinators and natural enemies next year, what should I do? First, think about the time, money, and equipment you have available, as well as the area you’d like to plant. There probably isn’t a single right way to establish this habitat, but there may be a best way for you. You can find more details on the techniques we used (and some links to other resources) here. This post was written by Amara Dunn, Brian Eshenaur, and Betsy Lamb. This work is supported by the Crop Protection and Pest Management Extension Implementation Program [grant no. 2017-70006-27142/project accession no. 1014000] from the USDA National Institute of Food and Agriculture. Announcement – Free pollinator course for growers! The Xerces Society is offering a free course on pollinator conservation to be held on November 7th in Basom, NY. The information will be most relevant to farmers and agriculture professionals, and priority for registration will be given to these audiences. Others who are interested in attending may join a waiting list and will be notified if additional space is available. Remember, habitat for pollinators can also be habitat for natural enemies of pests! 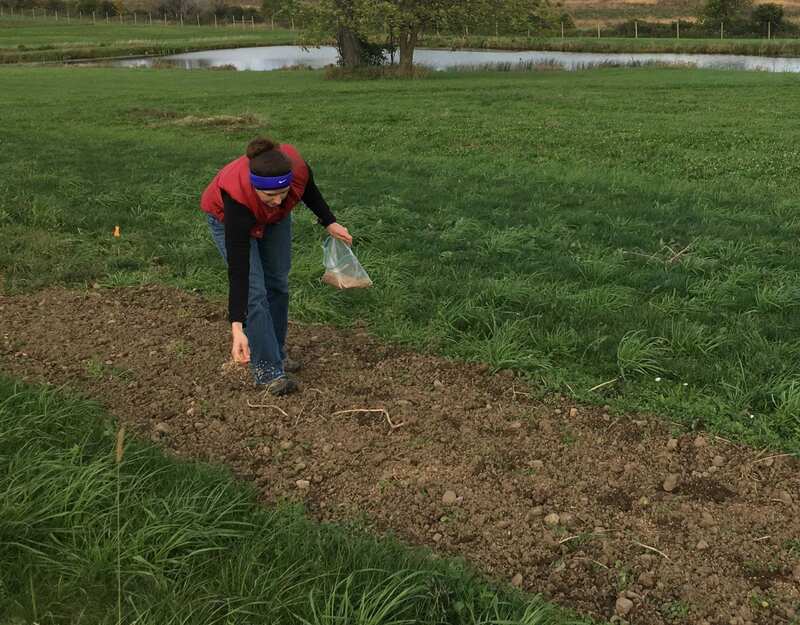 Dr. Betsy Lamb, Deb Marvin, and Brian Eshenaur (left to right) transplanting native wildflowers and grasses on the edge of a research Christmas tree planting at Cornell AgriTech in Geneva, NY. These plants will provide food and shelter for pollinators and natural enemies of pests. We are comparing 6 different methods of establishing habitat for beneficial insects, plus a control (Treatment E). Treatment E plots were sprayed with herbicide last fall and this spring, and will be mowed once this year. A summary of the plan for the other treatments is below. 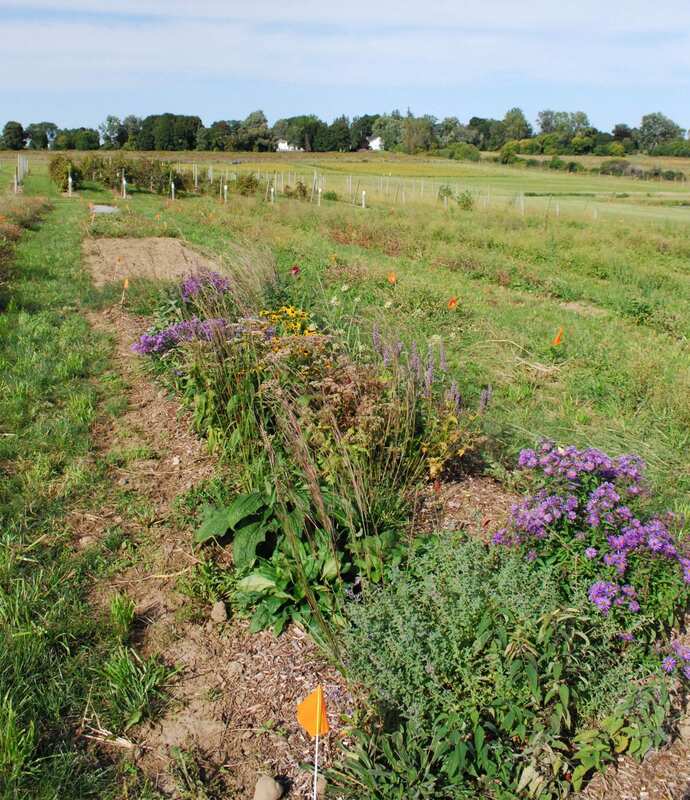 Comparing different methods for establishing plants that provide habitat and food for beneficial insects (pollinators and natural enemies of pests). Treatment E is the control. 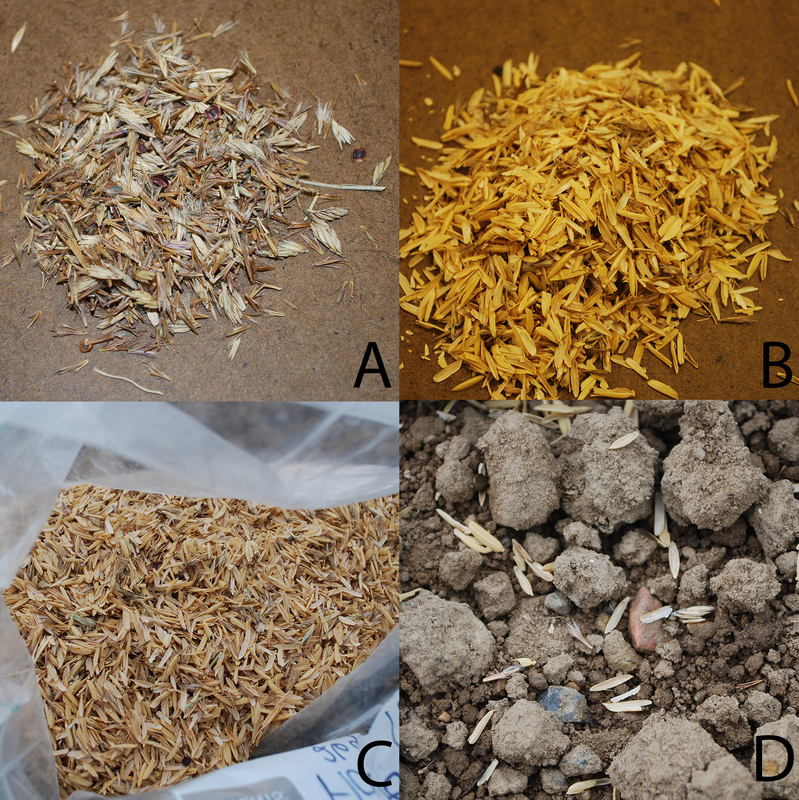 Native wildflower and grass seeds (A) were mixed with boiled rice hulls (B) to make them easier to broadcast (C). Much of what you see on the soil surface is just the rice hulls, but there are a few seeds that will hopefully grow into habitat for beneficial insects. Because of when spring tillage occurred, plots that were scheduled to be tilled in the spring did not need a second herbicide application. About a week after spring tillage, Treatment C plots were direct seeded. I hand-broadcast a mixture of native wildflower and grass seeds at a rate of half a pound per 1,000 square feet. This worked out to be 26 g of seed for each 5-foot by 23-foot plot. To make it easier to broadcast such a small amount of seed, I first mixed the seed for each plot with about 3 cups of boiled rice hulls. After raking the seed in gently with a garden rake, I stomped the seed into the ground to ensure good contact with the soil. In a larger plot, you might use equipment like a cultipacker or lawn roller to achieve the same result. Two weeks (and three-quarters of an inch of rain) after seeding, buckwheat is establishing. It will hopefully crowd out weeds that would otherwise grow in these plots over the summer. I broadcast (again, by hand) buckwheat seeds in the Treatment D plots at a rate of 70 pounds per acre (84 g for each of these small plots), and raked them in on May 31st. If the buckwheat establishes well, it will smother weeds during the summer, and we can mow and transplant into these plots in the fall. We plan to mow this crop of buckwheat when it starts flowering and then reseed it, for a total of two buckwheat plantings this summer. We transplanted by hand 15 species of wildflowers and 1 grass species into plots assigned to Treatments A and B on June 4th. Because we were able to transplant right after it rained, it wasn’t too difficult to plant into the untilled plots (Treatment A). Some of them still had some stubble from the cover crops and weeds that had been growing in this field last year, and were killed by fall and spring herbicide applications. Native wildflowers and grasses transplanted into untilled soil. Some dead weeds and cover crop still remain on the soil surface. 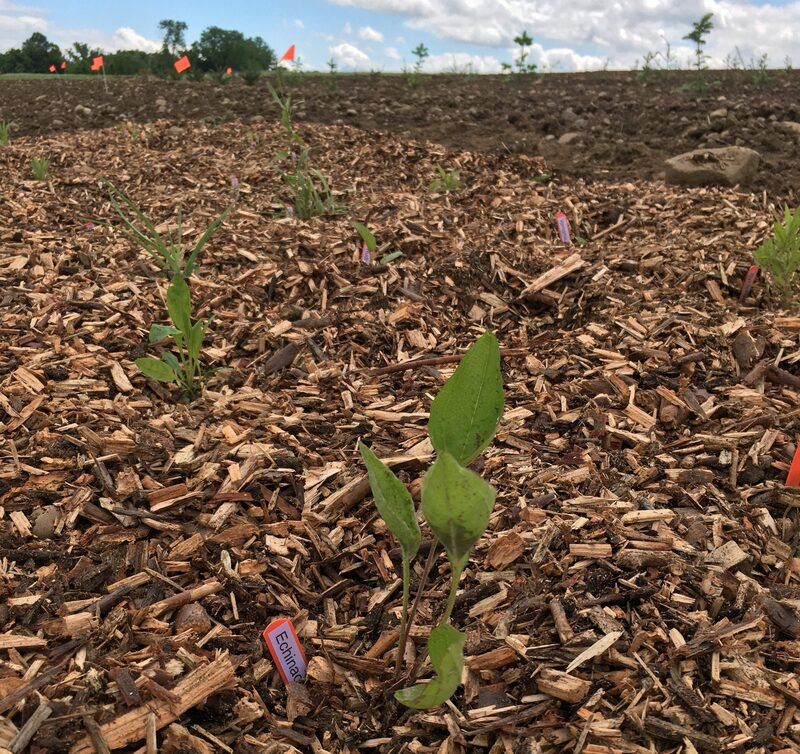 The day after we transplanted into Treatment B plots, we mulched the plants to a depth of about 3 inches to (hopefully) control weeds for the rest of the summer while the habitat plants get established. We used chips from shrub willow because they were available, but other types of mulch would work, too. These wildflowers and grasses will have help out-competing weeds from 3 inches of willow chip mulch. 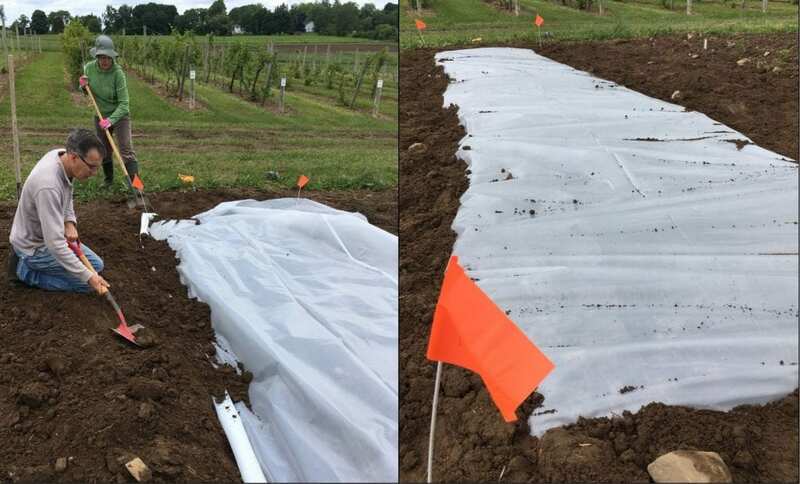 Finally, we laid clear high tunnel plastic over the plots receiving Treatment F. Ongoing research from the University of Maine suggests that soil solarization can be an effective form of weed control, even in the northeast. So we’re giving it a try! To maximize the efficacy of this technique, we laid the plastic when the soil had been tilled relatively recently, and was still very moist. 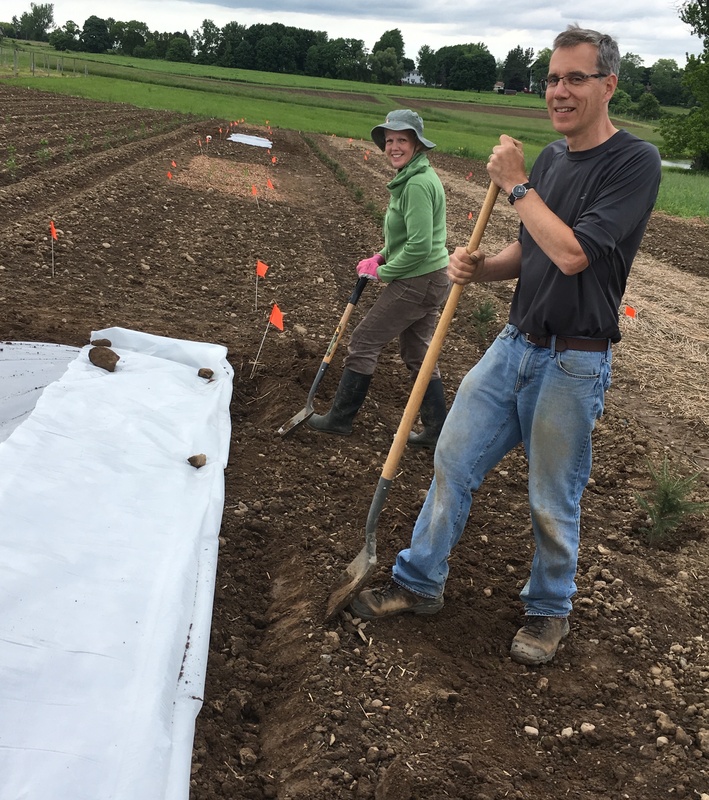 To keep the plastic firmly in place for the whole summer, we rolled the edges and buried them 4-5 inches deep, then stomped the soil down around all the edges. In the fall, we will hand broadcast a mixture of native wildflower and grass seeds over these plots (same mix as Treatment C). Deb Marvin and Brian Eshenaur (left to right) dig a trench to bury the edge of this sheet of clear plastic. The goal is weed control by soil solarization. We’ll give weed seeds in the Treatment G plots a few more weeks to germinate and grow (depending on the rain). Then we’ll kill them with an herbicide, and till these plots again to induce more weed seeds to germinate. Then we will repeat the herbicide application, till again, and so on. This should reduce the weed seed bank in the soil over the course of the summer. After a final tillage in the fall, we will broadcast seed from the same wildflower and grass mix we used for Treatment C. Fall is the recommended time for direct seeding beneficial insect habitat in the northeast. This treatment will also have the advantage of a full season of weed control prior to planting (also recommended). The downside is that it will take longer to establish the beneficial insect habitat. As we get these plots established, we’re keeping track of the time spent on each treatment and the costs of materials. In the late summer or fall, Dr. Bryan Brown will assess weeds in each treatment, and I will photo document how well our beneficial insect habitat plants have established in each plot. All of these data will help you choose the method that fits your timeline, budget, and equipment/labor availability. Stay tuned for more updates…including an invitation to a field day (not this year), so that you can come see the results of this project for yourself! This coreopsis flower (Coreopsis lanceolata) is more than just pretty; it also provides pollen and nectar for natural enemies to eat (when they aren’t eating pests!). At this time of year, glossy catalogs start arriving in my mailbox full of pictures of all the beautiful fruits, vegetables, and flowers that I could grow after the snow melts. What these pictures don’t usually show are the arthropod (insect, mite, and related species) pests that can’t wait to eat what I plant. There are many IPM strategies you can use to fight back against these pests, and you can learn more here. One of these strategies (and seldom is a single strategy sufficient) is to think about what else is growing near the vegetables, fruits, and flowers you want to protect. There aren’t just pest arthropods in your garden. These pests have natural enemies, too. If you provide good habitat for the natural enemies (including food and shelter), you will attract more natural enemies, and they are likely to consume more pests, protecting your plants. This is one way to practice conservation biocontrol – protecting and supporting the biocontrol organisms (natural enemies) that are already present. So, what makes good habitat for natural enemies? In general, plants that bloom throughout the growing season (early spring to late fall) provide pollen and nectar to the natural enemies that use these as alternate food sources (in addition to pests). These plants also provide good shelter, both for natural enemies and the arthropods (including some pests) they feed on. As these natural enemies reproduce in the habitat you have created for them, they will also venture beyond this habitat and into your fruit, vegetable, and other flower plants, where they will eat more pests. 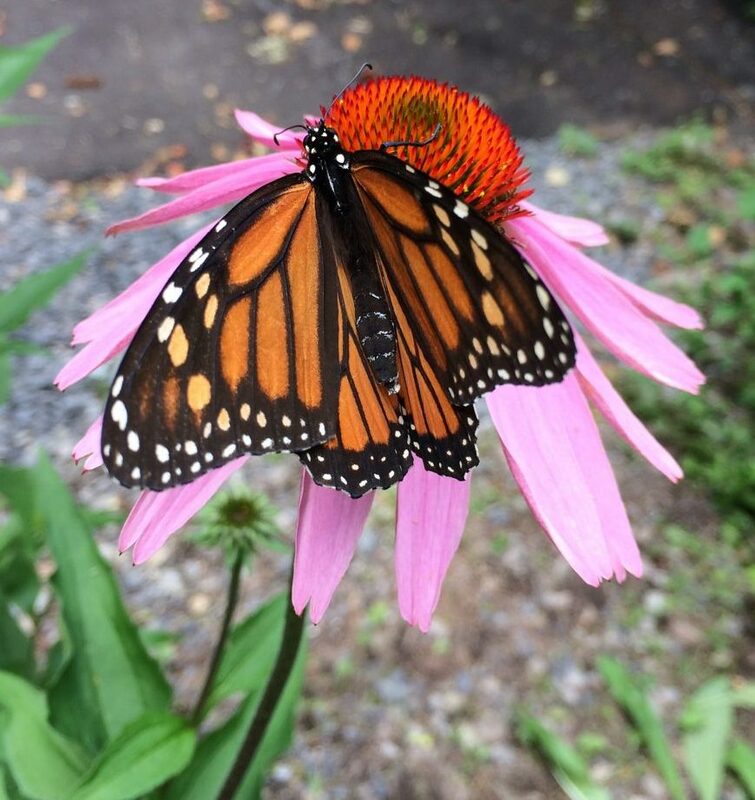 This butterfly is finding nectar at a purple coneflower (Echinacea purpurea). Pollen and nectar are also important food sources for some natural enemies. What is good habitat for natural enemies is also (in general) good habitat for pollinators. You have probably already heard how important pollinator protection is. Those glossy catalogs (or wherever else you buy your seeds or plants) likely sell species and varieties labeled as being “good for pollinators”. Just make sure you include plenty of variety. Because most plants (especially perennials) bloom for a limited time, you will need multiple species to ensure season-long blooms. Also, the variation in height and structure of the plants will provide diverse habitat for all of the different natural enemies you want to attract. And what about protecting a larger area of plants (like a 5-acre field of pumpkins on a farm)? Will creating habitat for natural enemies help with pest control? The answer is complicated. It probably depends on a lot of things. How big the field is, how much habitat there is and where it’s located, which pests are a problem, and other pest management strategies (especially use of chemical pesticides) will have an impact. Research has shown that in some scenarios, yes, providing habitat for natural enemies can reduce some pest populations in some crops (one example). Later this spring, I and two of my NYS IPM colleagues (Dr. Betsy Lamb and Brian Eshenaur) will set up a field experiment that will answer this question (over the next several years) in a Christmas tree planting. We will also compare different strategies for creating this habitat (seeds versus plants, and different weed control methods). Stay tuned for updates! 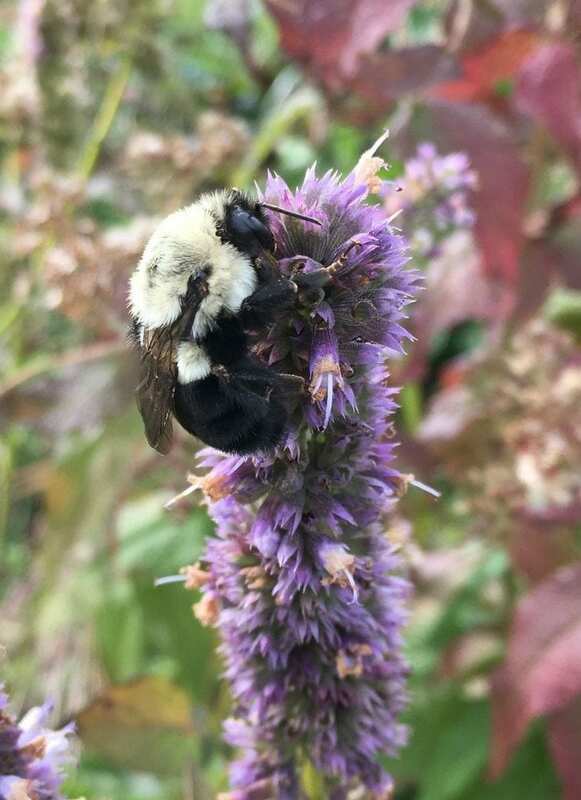 In the meantime, for suggestions on what flower species make good pollinator (and natural enemy) habitat, you can start by checking out lists of plants that provide good habitat for pollinators (also this one), or searchable databases of pollinator habitat plants. Your local Cornell Cooperative Extension office is another great resource. The Xerces Society also a resource on Habitat Planning for Beneficial Insects.